By now, there is a high chance you have either heard or read about the NAGA COIN (NGC), but have no clue how to become a proud owner of the token. NAGA’s token sale raised over $50 million USD, when more than 63,000 investors participated in the token sale and took advantage of the special bonus offered exclusively during the period. The NAGA Group’s success garnered the attention of some of the biggest names in the cryptocurrency community. “Bitcoin Jesus” Roger Ver, Founder and CEO of Bitcoin.com, his colleague and COO Mate Tokay, and Miko Matsumura, founder of the Evercoin cryptocurrency exchange and a Limited Partner with Pantera Capital, are the part of its advisory board now. In this article, we’ll help you understand what NAGA COIN (NGC) is, where to safely and quickly buy it, and how it is significantly different from your everyday altcoin. The NAGA COIN is at the core of the NAGA crypto ecosystem, powering a range of features and services offered by the NAGA Platform. As a NAGA COIN holder, you can benefit from substantial advantages by accessing cutting edge innovative technologies. With NAGA TRADER investing in the financial markets with fiat and crypto-currencies was never this easy and intuitive before. NAGA COIN users on NAGA TRADER will benefit from special conditions and reduced fees, giving even more opportunities to take on the markets and win. 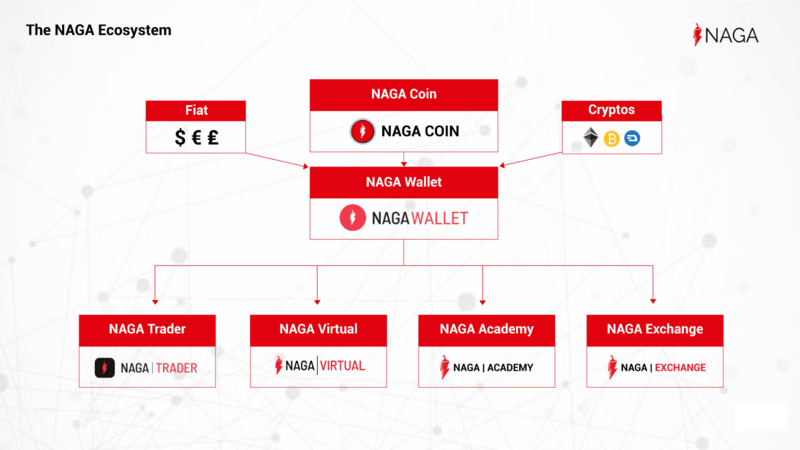 A unifier for these services is the NAGA WALLET, a user-friendly multi-currency wallet connected to NAGA TRADER, NAGA VIRTUAL and all future NAGA projects. 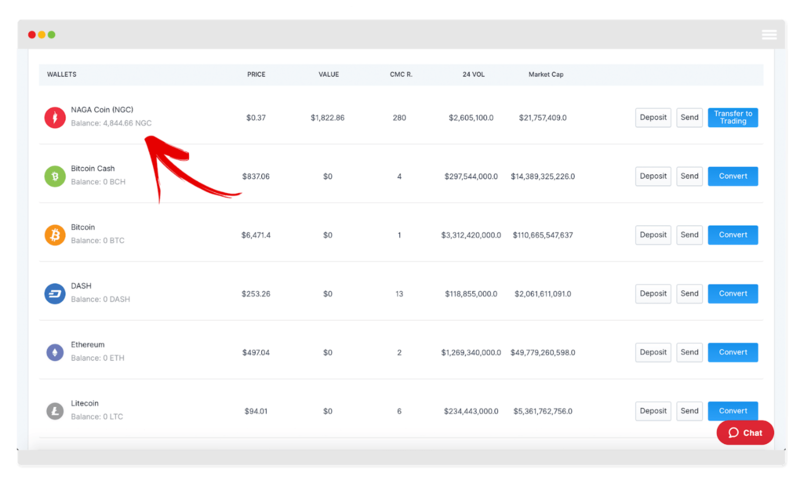 The NAGA WALLET facilitates the storage of all major cryptocurrencies, easy management of crypto portfolios, the simple transfer of funds between peers, and a multitude of unique features. 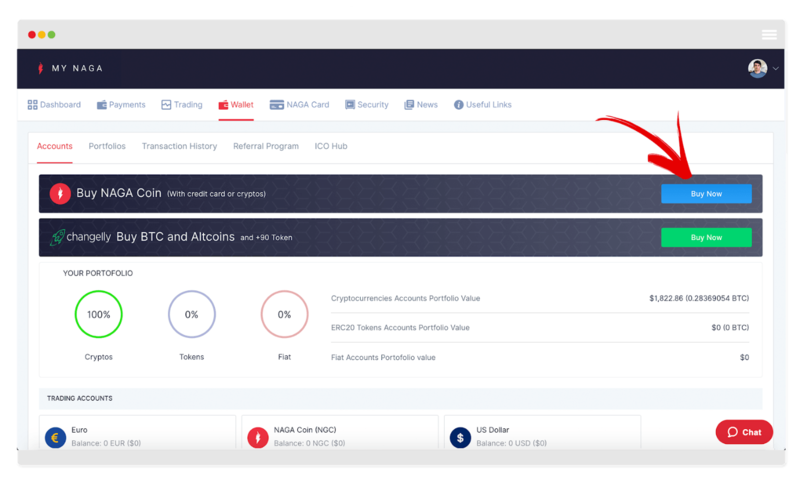 You can safely and quickly buy NAGA COIN (NGC) via NAGA WALLET or at OKEX, HitBTC, Cobinhood, BitForex, Changelly, Cryptology, Bittrex and UpBit, with NAGA WALLET as the easiest, most instant and safest method for NGC purchase. 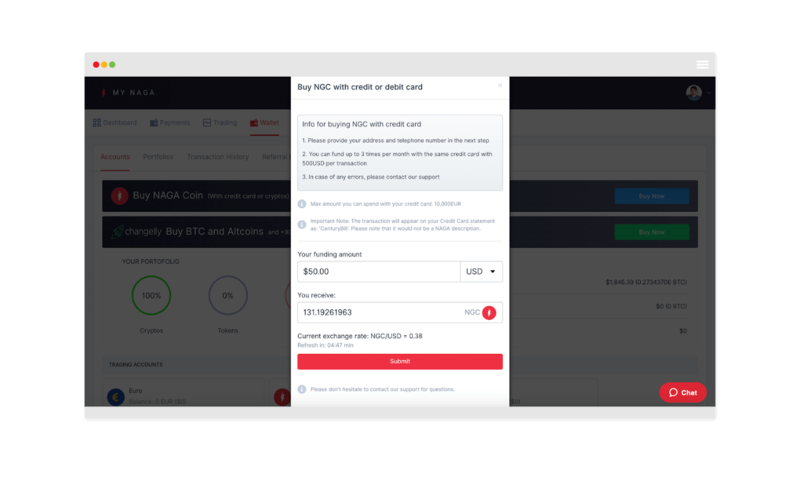 Here is the step by step guide on how to buy NGC on the NAGA WALLET using a credit/debit card. To open a NAGA WALLET account, visit: https://naga.com/wallet/; Select the Sign-Up button. Provide your registration credentials, including your name, email address, as well as your country of residence. Alternatively, you can sign up using your existing Facebook or Google accounts. 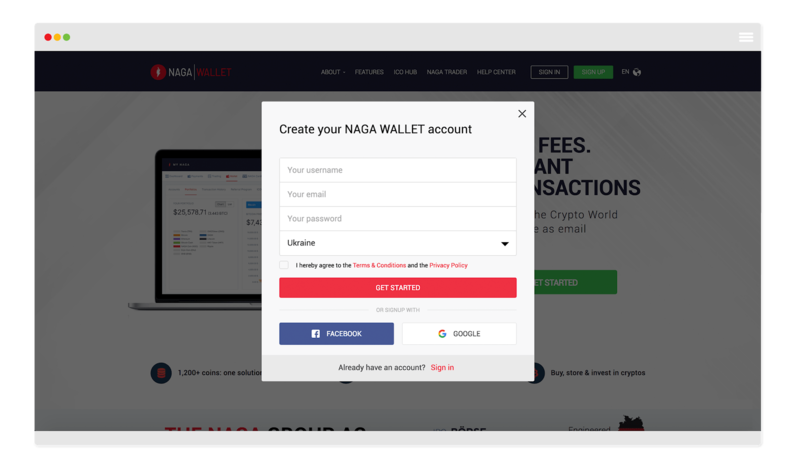 Once you are logged into your NAGA WALLET account, head over to the Accounts section. 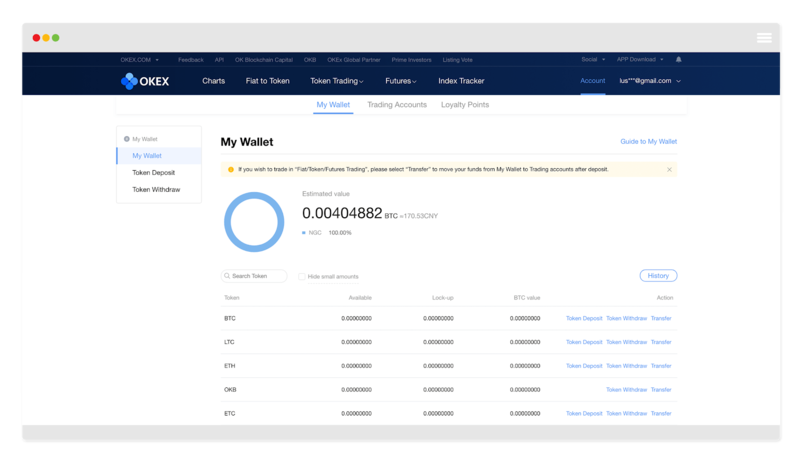 Below, you will find the Wallet section with all NAGA WALLET supported cryptocurrencies, as well as your current holdings in tokens and fiat. Next, to the Buy NAGA COIN (With Credit Card or Cryptos), press the blue “Buy Now” button. Select Buy NGC with Credit or Debit Card. 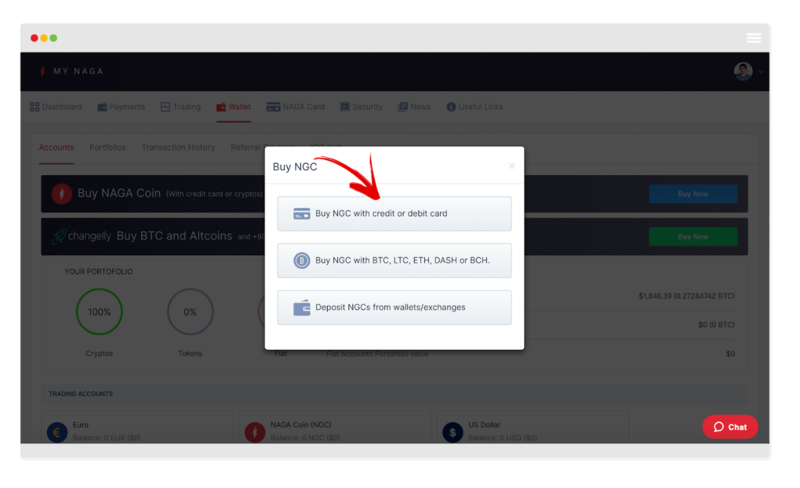 Credit or debit card NGC purchases can be facilitated with either USD or EUR accounts. Enter the funding amount for your NAGA COIN purchase, whether it is in USD or EUR. A real-time exchange will convert your funding amount to the actual number of NGCs you will receive. Hit the “Submit” button, if you’re satisfied with the exchange rate. 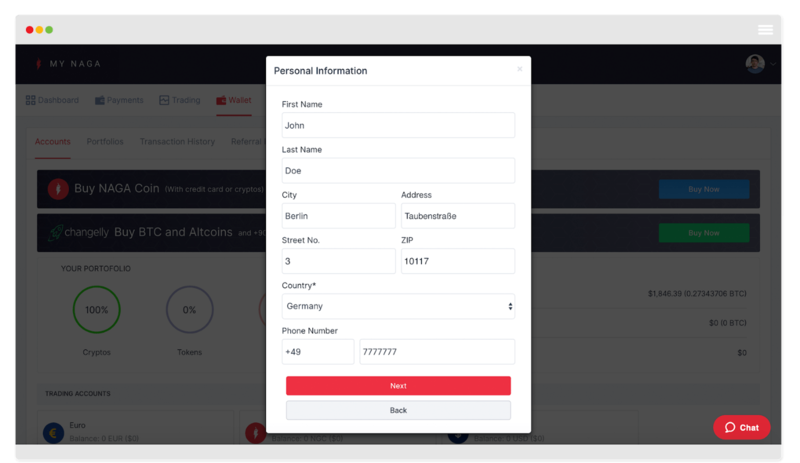 On the next page, you will have to provide your personal information, with your name, billing address, as well as your contact telephone number. Then, you will be redirected to an online payment form, where you have to provide your credit or debit card information. 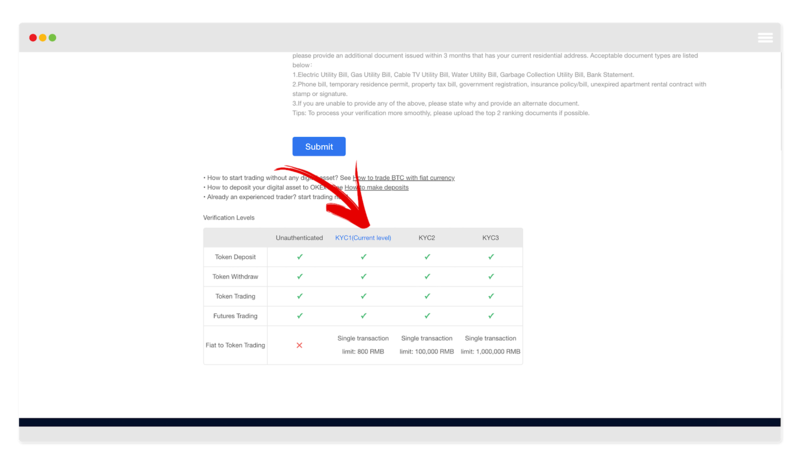 Once you have provided the information, select Complete Transaction and a confirmation pop-up will appear on your screen. To check your updated NGC balance on your NAGA WALLET, return to your Accounts section and find the updated balance under the NGC listing. 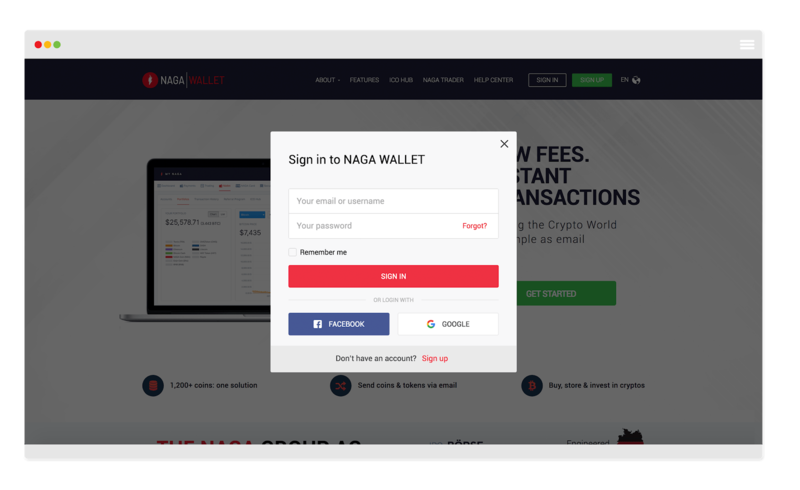 As a confirmation of your purchase, you will receive a notifying letter to the email address which you used to sign-up to NAGA WALLET. 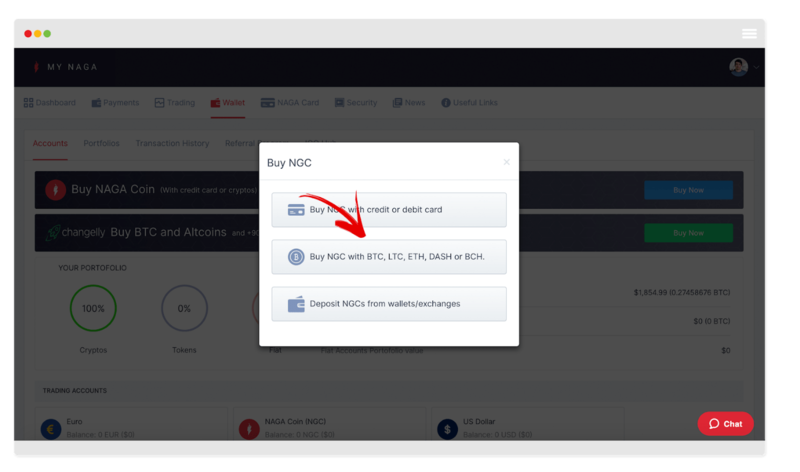 How to Buy NGC On NAGA Wallet with Cryptocurrencies? 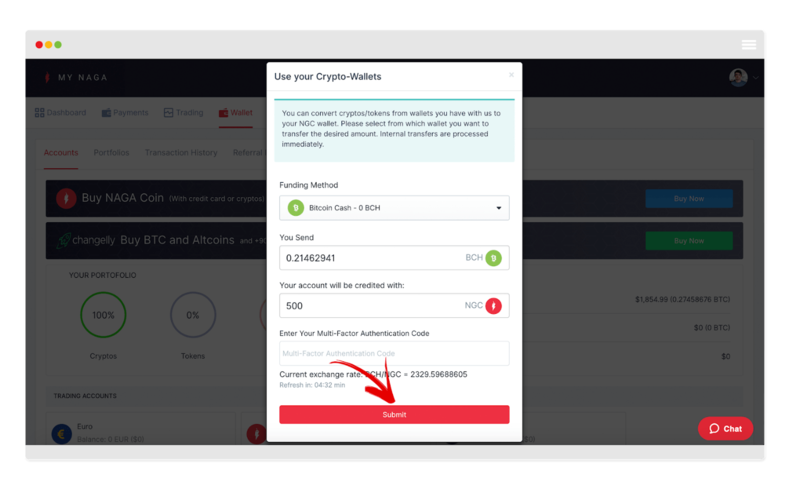 To purchase NGC using other cryptos on the NAGA WALLET, you will first need to open your NAGA WALLET account. Once you are logged into your NAGA WALLET account, head over to the Accounts section. 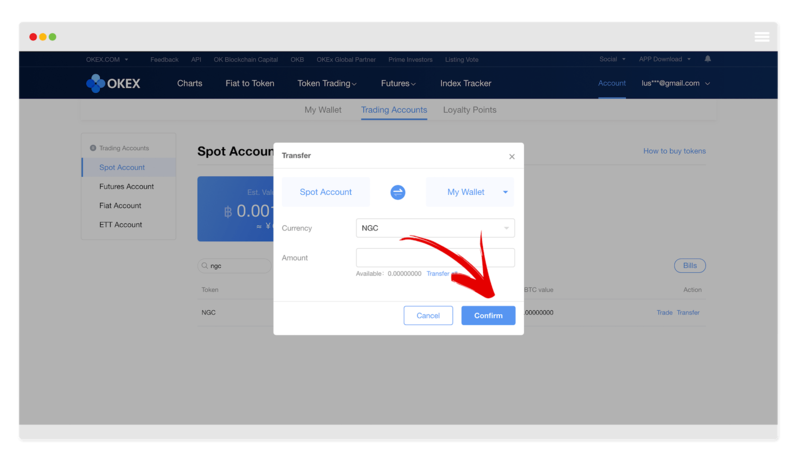 Below, you will find the Wallets section with all NAGA WALLET supported cryptocurrencies, as well as your current holdings in tokens and fiat. 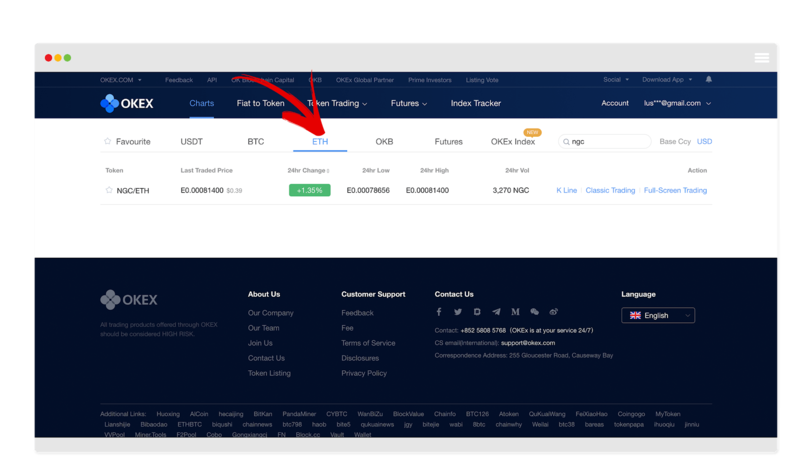 Next to the Buy NAGA COIN (With Credit Card or Cryptos), press the blue Buy Now button. Select Buy NGC with BTC, LTC, ETH, DASH, BCH or XRP. A pop-up screen will appear. Choose your Crypto Funding method and enter the token amount you wish to exchange for the NAGA COIN. A real-time exchange will convert your funding amount to the actual number of NGCs you will receive. If you’re satisfied with the exchange rate, press the Submit button. If you have a 2FA set up, you will have to provide your 6-digit Authentication Code. Confirm your transaction by pressing the Submit button below. To check your updated NGC balance on your NAGA WALLET, return to your Accounts section and find the updated balance under the NGC listing. As a confirmation of your purchase, you will receive a notifying letter to the email address which you used to register on the NAGA WALLET. How to Buy NGC on OKEX? 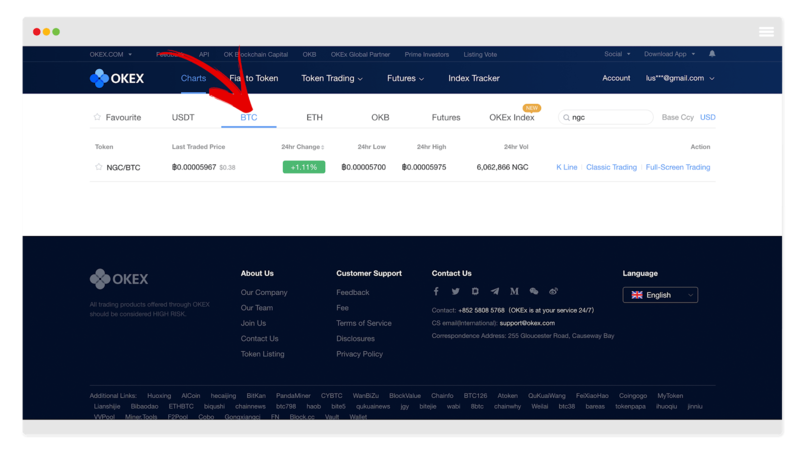 To purchase NGC, you will first need to open and verify your OKEX account. When the account verification is successfully completed, you will be able to deposit funds and purchase NGC. 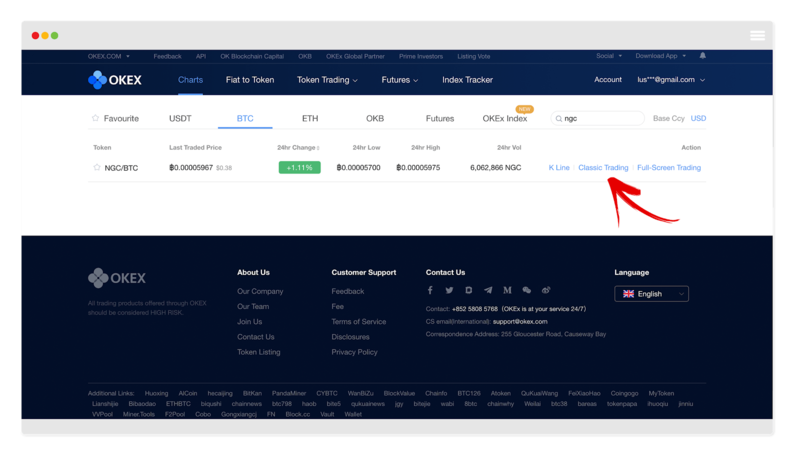 Level 1 verified users will be able to access most of the functions on the OKEX exchange, including performing token trading, futures trading, fiat – index trading and fiat – C2C trading (with a single transaction limit of $2,000 per order). Select Token Deposit and choose your preferred cryptocurrency. 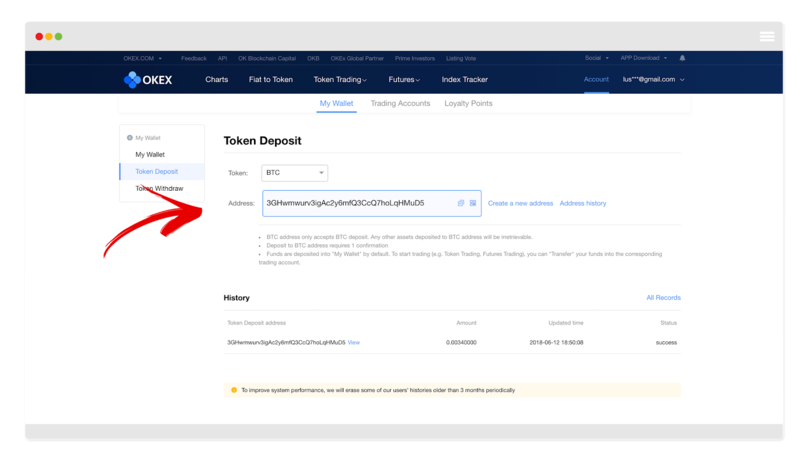 Copy your provided deposit address and use it for depositing your chosen tokens via a preferred cryptocurrency wallet. 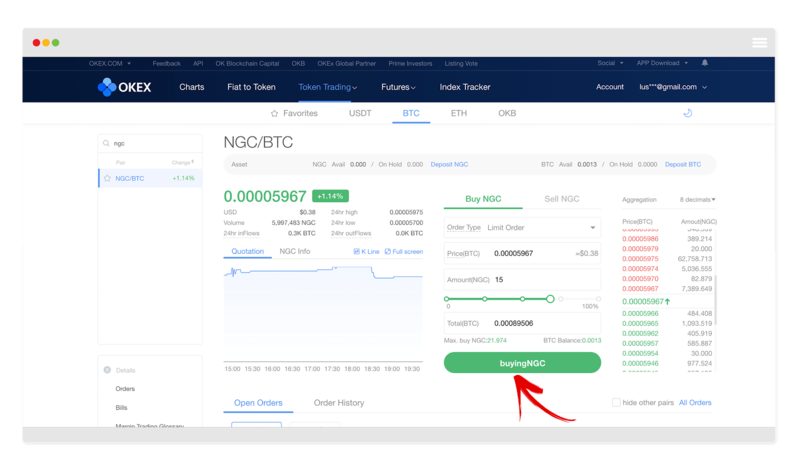 In order to purchase NGC, you need to choose one of the two trading markets – NGC/BTC or NGC/ETH, depending on the cryptocurrency in your possession. 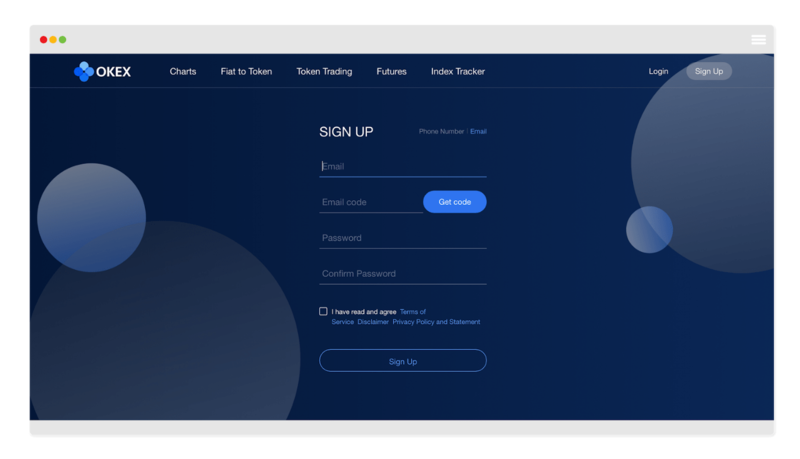 On the right of the NGC/ETH or NGC/BTC trading pair, select Classic Trading, where you will be redirected to a new tab with live NGC price charts and buy/sell orders. Choose your Order Type and enter the amount of NGC you would like to purchase. 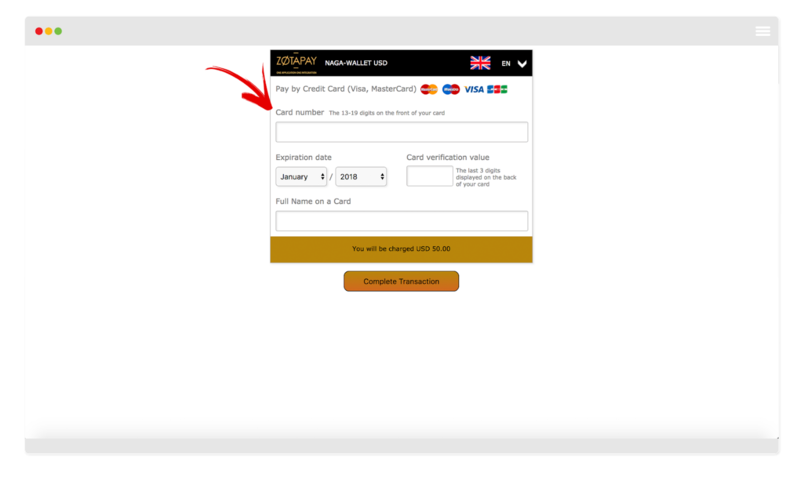 To confirm your purchase, press Buy NGC, and enter your account password to verify your transaction. 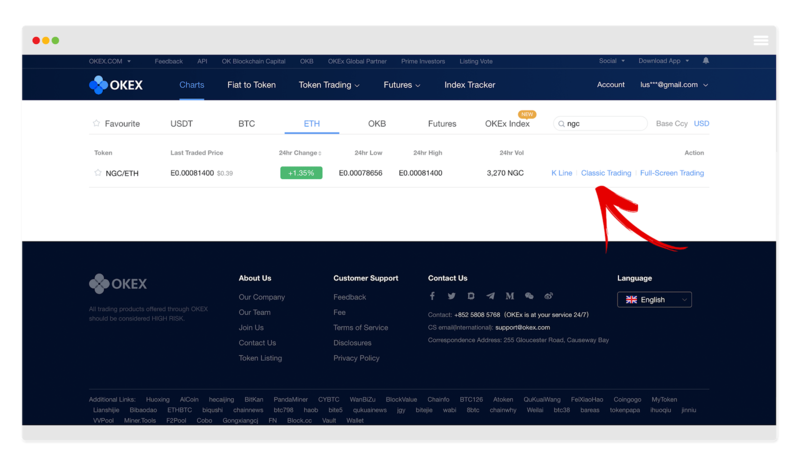 Press Confirm to finalize your exchange. A green notification with “Success” will appear at the top of the screen. 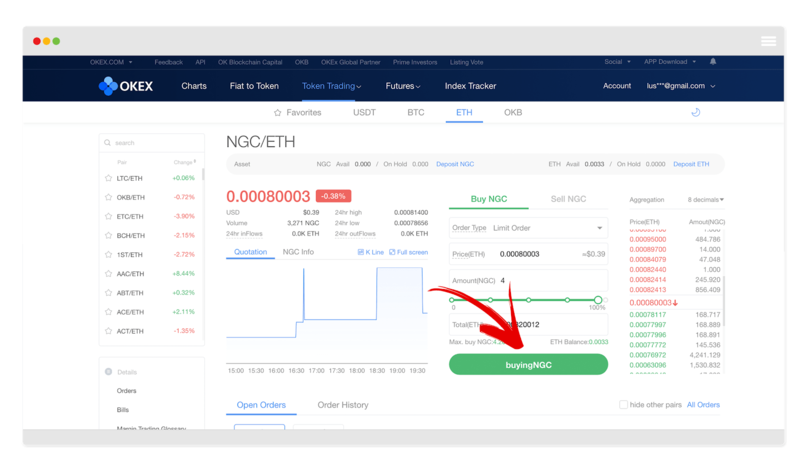 To check your NGC holdings, head over to your Trading Accounts and search NGC in the search bar.